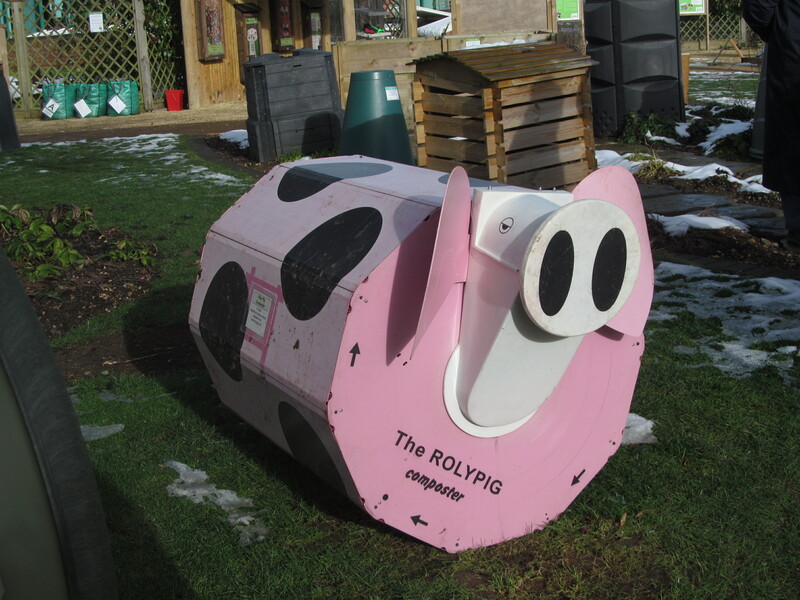 Will this really make composting more interesting? Well, the rain didn’t wash away all the snow but at least the blue sky and the temporary appearance of the sun cheered us up a bit. 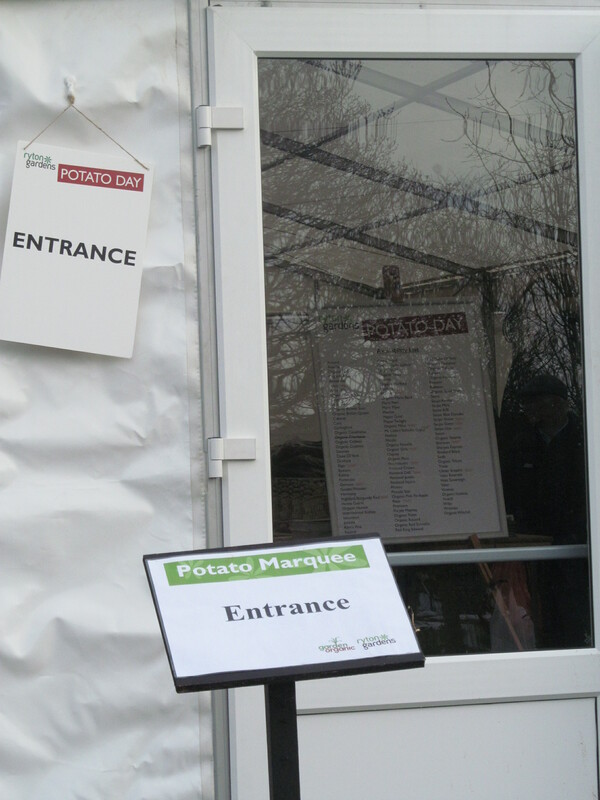 So we dared to get in the car and venture out to Warwickshire for the members’ day of “Potato Day”. It is not as arcane as it might sound but we have been in previous years so it was not so much of a novelty this time. However, I like the fact that you can buy potatoes singly and choose from dozens of different varieties. After last year’s poor performance I have gone back to salad blue and kestrel. We have limited space so we do all our potatoes in bags and/or large pots and have to be careful not to overcrowd them – that is counter-productive in terms of yield. However, I couldn’t resist trying out a new variety called “purple majesty”. These are, as the name implies, purple in colour. We’ll see how they go. Well the cakes were just little sponge cakes just like the ones we used to make with mother when we were little children. The main difference in the recipe was that the eggs were separated and the whites whipped before being folded in. The claim that these “would melt in the mouth” wasn’t exactly untrue but they were no more special than our ‘ordinary’ buns. In other words, the little Madeleine cakes we made were nice but did not live up to the hype of the recipe we used this time. Meanwhile, our experiment with growing potatoes of the variety Madeleine, was a mixed success. We grew them in the poor sandy soil of the allotment, threw on some chicken manure pellets and a leaf mould mulch, watered sporadically and hoped for the best. So if we did not get a particularly high yield after such benign neglect we can hardly complain. When it came to cooking and eating them I was not overly impressed though. They don’t work boiled: they just fall apart. As a baked potato they worked quite well and even had some flavour (lost when boiled). Sautéed they worked quite well (but not so good if par-boiled). The long and the short of it is that these Madeleines were all right. I don’t think we’ll bother with that variety of potatoes next year though. Next will be King Edwards or Salad Blue. The warm Spring gave our potatoes a head start so that one lot of main crop appeared to be ready earlier than the earlies. Although the Spring was warm it was also very dry; meanwhile Summer has been largely warm and wet. According to a weather person on TV it is perfectly normal for our Summers to be warm and rainy: hot dry ones are the exception rather than the rule but British people still seem to think they are usual and are disappointed when they are not. The ideal for most of our crops is, I suppose, warm sunshine and showers. This is not the first time I’ve mentioned our potatoes (see here) but I am pleased enough with this year’s crop to put it on the record. Meanwhile, our potatoes so far have had flavour and worked well either baked or sautéd. The Lady Balfour are a new variety to us and have tasted quite good but they were expensive compared to other varieties – probably cheaper to buy them from the supermarket by the time we’ve improved the soil, watered them etc. The kestrels do OK in the sack method, have not succumbed to disease and also have a reasonable taste. The Madeleines are not ready yet. I believe they are a new variety so I’m not sure whether they are an early, main or late crop. My guess is that they are a main crop and won’t be ready until sometime in September. Rincewind’s greatest desire was for a plateful of potatoes. Now, I don’t think I get that excited by them – picture soggy mash or boiled potatoes you could bounce off the wall (old school dinners any one?) and I’d rather have pasta. On the other hand, I like crisps as a snack, chips (from a decent chippy) and roast potatoes with a meal are another matter. Another attraction is that for someone like me, who does not have green fingers, they are relatively easy to grow. Of course there is the proper way to prepare the soil, earth up etc but you can get a crop if the best you can do is benign neglect. Last year was an exception because, although the weather could have been worse, it was warm too early and cold midseason and it rained at the wrong time – I ended up watering our potato plants much more often and ordinarily it would not have been necessary. Still, we got a crop. This weekend HDRA (also known as Garden Organic) held their annual Potato Day. OK so it’s a bit of a niche hobby, perhaps, but the advantage of it is that you could buy individual seed potatoes if you just wanted to have a go.Some in the crowd were like me – more of a hobbyist than a gardener. Some were obviously taking it more seriously and left carrying several bags of different kinds of potato. There was even a presenter from BBC’s Gardener’s World (Alys Fowler, I think it was) chatting away while the camera panned up and down a display of potatoes. I would think that a fondness for potatoes has gone too far if you start admiring their good looks – potatoes are for growing, cooking and eating. My first attempt at growing them was a single potato in a large (45 cm) pot. Recently I have discovered that you can plant two or three tubers in a large pot or sack and get reasonable results. The keen gardener or allotment holder will buy sacks of them and do several rows. Sorry but not only does that seem too much like hard work but I really haven’t the time. Perhaps half a dozen in a corner somewhere this year but it will have to be according to the “benign neglect” school of gardening. But it can be fun trying out different varieties of potato. Yes, I really did type that last sentence. If you’ve ever tried Salad Blue, which are a purplish-blue in colour and watch the colour change as you cook them, you’ll see what I mean. They don’t really work boiled as they tend to fall apart but you could see if your friends will eat blue mash. And it really can make a difference as some varieties are better as a salad potato (if you like that sort of thing) and some are better for chips. Despite the name, the aforementioned Salad Blue potatoes are best sautéd. I don’t necessarily expect great success with growing potatoes but growing pasta just isn’t an option.